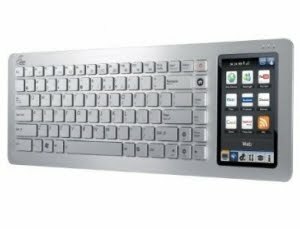 Recently ASUS has officially announced the launch of its Eee Keyboard PC, which you can connect to an external monitor, projector or HD television. The Eee Keyboard PC is going to be powered by an Intel Atom N270 processor, featuring 1GB of DDR2 memory. The device is rather lightweight - only 2.4 pounds. It is finished in aluminum, having a UV-coated underside that boasts high resistance. At its basic level, the 5-inch multi-touch panel, located to the right of the main keying area and having a resolution of 800x480, can be set to manage onscreen activity. If you wish to launch the media player, the screen will show its content, making it possible to surf through various data and play songs with just a tap of a finger. The PC will run Windows XP Home. Among other features of the device one may find 802.11n wireless networking, Bluetooth 2.1 and ultra wideband wireless video transfer. You can use the USB 2.0 ports to expand the capacity of the onboard 16GB/32GB SSD drive.